For the past few weeks I’ve been in Melbourne, on research leave, working on two novels (the endgame of one, the beginnings of another), attending conferences and so on. 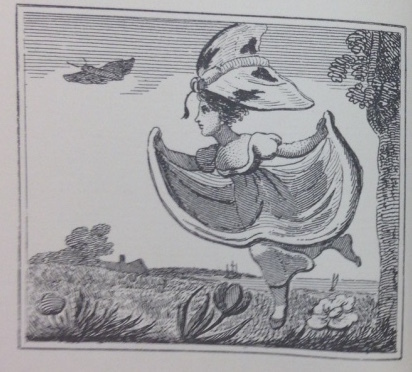 One of the most excellent things I’ve been doing is messing about in the Monash University’s Rare Books Collection, most specifically having a wonderful time with their impressive collection of fairy tale and related publications. 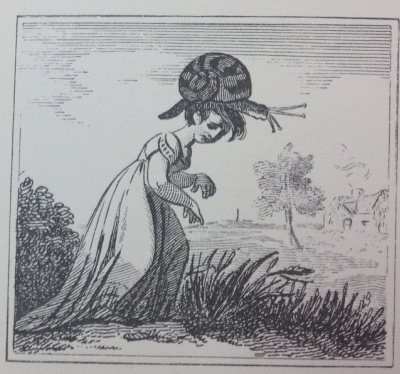 Over the next few weeks, I’d like to share a few little treasures I’ve discovered in the collection, and I thought I’d start with a beautiful little chapbook first published in 1807. As the cover page tells us, this tiny booklet is ‘said to be written for the Use of his Children by Mr. Roscoe‘, and was printed at the ‘Original Juvenile Library, the Corner of St. Paul’s Church-Yard’. Mr John Roscoe wrote the poem, probably in around 1802, for his children. He and his wife Jane (nee Griffies) were the parents of 7 sons and 3 daughters. Roscoe was an abolitionist (he wrote a long narrative poem, The Wrongs of Africa, published in two parts in 1787 and 1788) and a keen amateur naturalist. In the early 1800s, he was involved in a group project to create a Botanic Garden in his home town of Liverpool. Perhaps his time in the gardens gave him the idea of writing about an insect ball for his children’s entertainment! 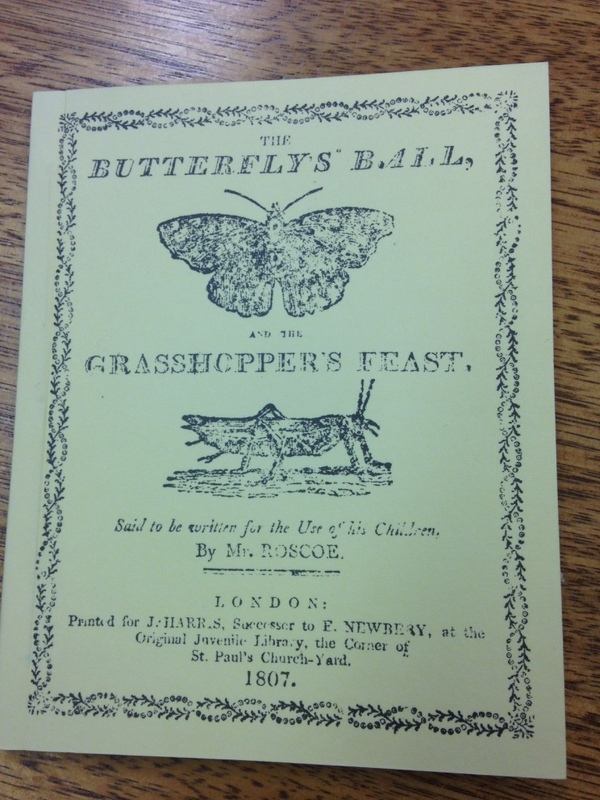 In November, 1806, The Butterfly’s Ball and the Grasshopper’s Feast was published in the Gentleman’s Magazine and the Lady’s Monthly Museum. Roscoe’s little poem was, as much as anything was in the Regency period, an overnight sensation. Everybody read it. Even the royal family. King George III and Queen Charlotte requested a copy of the verse be set to music by George Thomas Smart. The resulting glee was performed by the Royal Princesses Mary, Elizabeth and Augusta, for their parents, during a visit to the seaside resort of Weymouth. 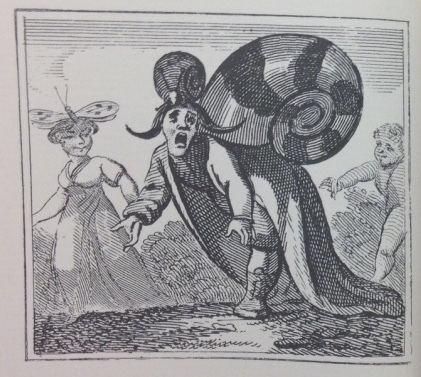 The copy in the Monash collection is a facsimile of the 1807 original. 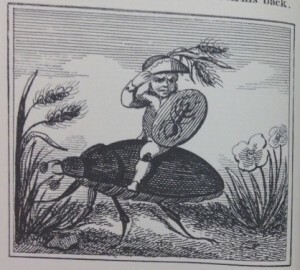 The text is accompanied by delightful black-and-white illustrations, copperplate engravings by William Mulready. Some very witty or fey. Would you like to see them? I’m sure you would. 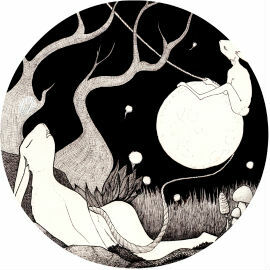 Well, here’s the text of the little poem, with some of the gorgeous illustrations for your amusement. 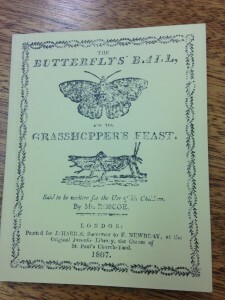 To the Butterfly’s Ball, and the Grashopper’s feast. To an evening’s amusement together repair. Who carried the Emmet, his friend on his back. And all their relations, Green, Orange, and Blue. And the Hornet, with Jacket of Yellow and Brown. But they promised that ev’ning, to lay by their sting. Came from a great Distance, the Length of an Ell. A water-dock leaf, which their table cloth made. And the Bee brought the honey to sweeten the feast. And went in his own little chamber to bed. Their watchman, the Glow-worm, came out with his light. For no watchman is waiting for you or for me. Oh, and just in case it sounds a little familiar, the tale was resurrected into the popular imagination in 1973, when Alan Aldridge created a new set of illustrations for the poem and published his own, modern version of the book. His technicolour, detailed Butterfly won the 1973 Whitbread Children’s Book of the Year Award. Aldridge’s book in turn inspired the former Deep Purple band member, Roger Glover, to produce an album of the same name. Glover’s concept album became the basis of a rock opera staged at Albert Hall, London, in 1975. The lead single from the album (Love Is All), sung by Ronnie James Dio (of Black Sabbath) was a big hit in The Netherlands: you might even remember hearing it yourself.